 Click here to find out more information on our Town Hall Meetings! 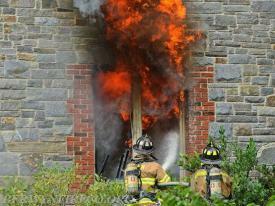 BERWYN, PA - Berwyn volunteer Joshua C. Lichman was appointed to the position of Lieutenant earlier this month. 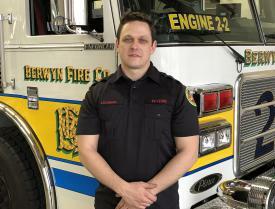 Josh joined the Company as a firefighter in 2009 while enrolled at Saint Joseph’s University where he attained a bachelor’s of science in business administration majoring in finance. BERWYN, PA - The Berwyn Fire Company will hold an informational meeting on Tuesday, April 9th at 7:00 p.m. at the fire station located at 23 Bridge Ave. in downtown Berwyn. This is located across the street from the Goodwill Store located on Lancaster Ave. The purpose of this meeting is to recruit new volunteers. 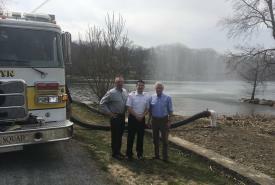 BERWYN, PA - In partnership with the Leopard Lakes Farm, Inc. in Easttown Township, the Berwyn Fire Company recently placed into service new dry fire hydrants to improve fire protection for its homeowners. The three hydrants are strategically placed around the lake that encompasses nearly 40 homes. EASTTOWN TWP., PA - On Sunday, March 24th at 8:20 p.m., the Berwyn Fire Company was dispatched to the 700 block of Waterloo Rd. 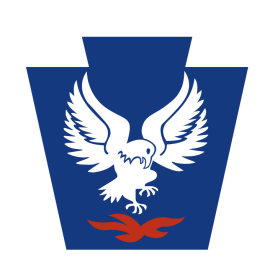 in the Devon section of Easttown Twp. for a transformer fire. 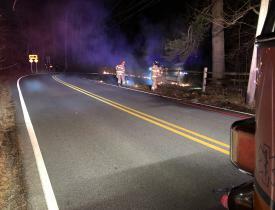 A few minutes later, the call was upgraded by the Chester County 9-1-1 Center to a motor vehicle collision with a brush fire. BERWYN, PA – The Berwyn Fire Company has been awarded $21,966.58 in grant funding by the Office of the State Fire Commissioner (OSFC) through the 2018 – 2019 Fire Company and Emergency Medical Service Grant Program. The Berwyn Fire Company will be utilizing these grant funds to assist with debt reduction on a fire truck loan and equipment purchases to support fire and EMS operations.